The BMW X2 just took the stage as the newest addition to the BMW X family. On October 25, 2017, BMW announced the first-ever BMW X2, a new breed of car takes on the stage as the newest addition to the BMW X family. The BMW X2 features an unmistakable design with sporty yet urban genes. The car’s specifically tuned chassis and xDrive, BMW’s intelligent all-wheel-drive system, promise undiluted driving fun. The cutting-edge BMW TwinPower Turbo engine strikes the ideal balance between sporting dynamics and exceptional efficiency powering this Sports Activity Coupe in just 6.3 seconds from 0-60 mph. 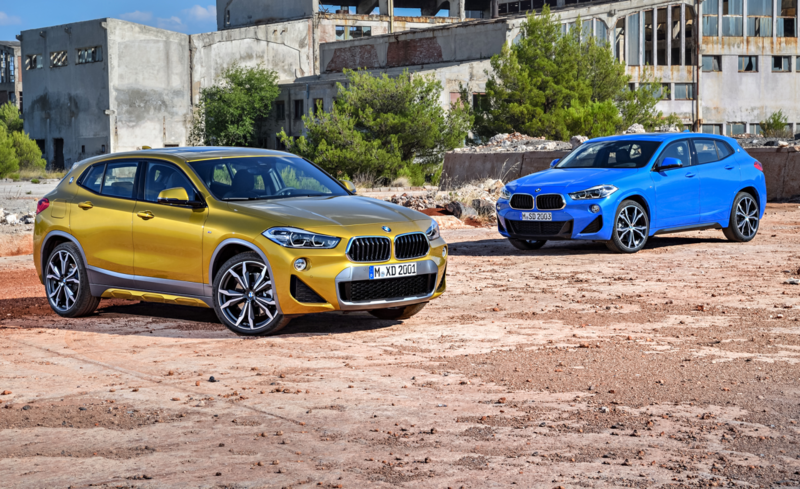 The latest digital services from BMW ConnectedDrive and BMW ConnectedDrive Services add the necessary technology for the first-ever BMW X2 to fit perfectly into a seamlessly connected lifestyle. Above all, it is the BMW X2’s proportions which create its expressive, dynamic demeanor. It is 3.2 inches shorter and 2.8 inches lower than the BMW X1, yet has the same wheelbase giving the first-ever BMW X2 a more muscular look. Featuring short overhangs, it also has a stretched, coupe-style roofline and slim window graphic. Design highlights: rear end.Rear spoiler. BMW X2 equipment option highlights. The trim finishers in the BMW X2 reinforce the car’s high-class appeal. Trim finishers in Black high-gloss with a pearl chrome accent strip are fitted as standard. Four additional trim finishers are available as an option with accent strips in Pearl-effect Chrome and 6-color LED contour lighting in the door trim. BMW X2 M Sport X equipment option highlights. Interior and equipment: Contemporary ambience with premium flair. The interior of the BMW X2 blends signature BMW elements, such as a pronounced driver focus and dynamic lines, with the understated ruggedness of a BMW X model. The high-class quality of the BMW X2 and its impressive level of equipment, even in the standard version, are both instantly apparent. The instrument panel has contrast stitching and decorative stitching as standard, while the center console features materials including Sensatec with contrast stitching. Eye-catching highlights can be added by opting for the newly available perforated Dakota leather in Magma Red. Digital services in the first-ever BMW X2. The intelligently connected, clever way to travel. As far as BMW is concerned, there is one thing that always comes first in a connected vehicle: the task of driving. For this reason, all of the BMW ConnectedDrive and BMW Connected elements in the new BMW X2 have once again been designed to assist, inform or entertain the driver at the appropriate time using just the right services. Intuitive interaction between driver and vehicle forms the basis for top-class connectivity. The new BMW X2 offers its driver three different ways of interacting with their car, as the sixth generation of the iDrive control concept now supplements the familiar iDrive Controller, the cloud based voice control, as well as optional touchscreen operation for the Control Display. The touchscreen can also be used comfortably by the front passenger.